Harmony Server has a client-server configuration linked through a network. Although the user is working on a client machine, all of the data is saved on the server. You can compare the Harmony Server structure to a filing cabinet. Every element is structured and follows a strictly organized hierarchy. The job is a drawer in the filing cabinet containing all the folders related to the drawer’s topic. A Harmony Server scene can only be saved inside the structure. This maintains structural organization so nothing is lost. 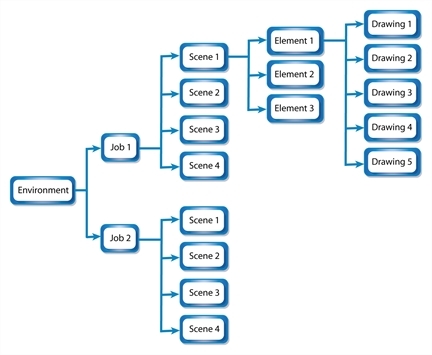 By adhering to this structure, every user working in the database always knows where to find the scenes to work on. Before you create or save any elements in your production, you should decide upon a project name. This should reflect the content or title. Use the name to create the project’s environment, where you will store all of your production elements. For example, the environment could be called adventure_movie. An environment can be used for movies, series, commercials, student work database, etc. For commercials, which are rather short, you can create an environment, such as commercials. Then you can create one job per commercial: toothpaste, soap, car, and so on. As commercials are short and do not require splitting into episodes or sequences, you can group them all in the same environment. For a database of student’s work, you can create an environment and name it with the class or group name, such as gr402a. Then you can create one job per student: smith_john, robertson_jane. And then store the different student exercises in separate scenes under their job name.